The variability of Pinus sylvestris growth over two geographic transects across Europe has been explored through a process-based forest growth model (Hydrall: HYDRaulic constraints on ALLocation) which accounts for the effects of environmental conditions not only on short-term gas exchanges, but also on allocation and tree structure. The model has been validated against both eddy-covariance and growth data under contrasting environmental conditions. Forest growth was found to be reduced by low temperatures (-50%) and water stress (-37%) at the opposite extremes of the natural range of the species. Application of a functional model made it possible to partition growth reductions between individual processes. Gross primary production was severely affected by low temperatures and short vegetative periods at the northern extreme of the specific range (-53%), and by low air and soil humidity at the southern limit (-26%). The ratio between net and gross primary production was found to be rather constant across the temperate region, only increasing in the boreal zone in response to low temperatures (+20%). Under dry conditions, on the contrary, a substantial proportion of the reduction in aboveground productivity was attributed to the need to allocate increasing amounts of resources to fine root production and maintenance (+16%). Both short and long-term responses should be considered in the prediction of climate change impact on forests. State-of-the-art of models of production-decomposition linkages in conifer and grassland ecosystems. Ecological Applications 1: 118-138. Ecosystem physiology-soil organic matter. In: “Global change: effects on forests and grasslands” (Breymeyer A, Hall DO, Melillo JM, Ågren GI eds). John Wiley & Sons, Chichester, pp. 207-228. Relations between tree height and diameter, productivity and allocation of growth in a Scots pine (Pinus sylvestris L.) sample tree material.In: “Crop physiology of forest trees” (Tigerstedt PMA, Puttonen P, Koski V eds). University of Helsinki, Helsinki, Finland, pp. 95-105. Barley straw decomposition in the field: a comparison of models. Ecology 68: 1190-1200. La forêt en France. La Documentation Française, Paris, pp. 142. Implications of varying pipe model relationships on Scots pine growth in different climates. Functional Ecology 11: 146-156. Fine roots vs. needles: a comparison of13 C and15 N dynamics in a ponderosa pine forest soil. Biogeochemistry 79: 361-382. Range of natural distribution. In: “Genetics of Scots pine” (Giertych M, Matyas C eds). Elsevier, Amsterdam, The Netherlands, pp. 19-30. Global change: effects on coniferous forests and grasslands. John Wiley, Chichester, USA, pp. 459. Sensitivity of growth of Scots pine, Norway spruce and silver birch to climate change and forest management in boreal conditions. Forest Ecology Management 232: 152167. Soil physics with BASIC. Transport models for soil-plant systems. Elsevier, Amsterdam, The Neteherlands, pp. 150. World forest biomass and primary production Data. Academic Press, New York, USA. Carbon allocation in trees: a review of concepts for modelling. Advances in Ecololgical Research 25: 50-104. Possible impacts of climate warming on trees and forests in the United Kingdom: a review. Forestry 62: 337-364. A four-layer model for the heat budget of homogeneous land surfaces. Quarterly Journal of the Royal Meteorological Society 114: 373-398. A comparison of forest productivity in Britain and Europe in relation to climatic factors. Forest Ecology Management 2: 75-102. Photosynthate allocation in Pinus taeda. I. Substrate requirements for synthesis of shoot biomass. Canadian Journal of Forest Research 7: 106-111. Europe-wide reduction in primary productivity caused by the heat and drought in 2003. Nature 437: 529-534. A simple model of light and water use evaluated for Pinus radiata. Tree Physiology 17: 259-265. Yield models for forest management. Rep. 48, Forestry Commission Booklets, Forestry Commission, UK. Beziehungen zwischen Bestandeshöhe und Bestandesmasse. Allgemeine Forst und Jagdzeitung 80: 45-49. Modelling of photosynthetic response to environmental conditions. In: “Encyclopedia of Plant Physiology” (Lange OL, Nobel PS, Osmond CB, Ziegler H eds). New Series. Vol. 12B. Physiological Plant Ecology II. Springer Verlag, Berlin, Germany, pp. 549-587. An empirical model of stomatal conductance. Australian Journal of Plant Physiolgy 11: 191-210. Response of understorey vegetation and Scots pine root systems to fertilization at multiple deficiency stress. Plant and Soil 168-169: 179-185. Toward an allocation scheme for global terrestrial carbon models. Global Change Biology 5: 755-770. The atmospheric boundary layer. Cambridge Univ. Press, Cambridge, UK, pp. 316. Environmental constraints on the structure and productivity of pine forest ecosystems: a comparative analysis. Ecological Bulletins 43. Modelling potential crop growth processes. Kluwer Academic Press, Dordrecht, The Netherlands, pp. 238. Temperature as a determinant of plant productivity. In: “Plants and Temperature” (Long SP, Woodward FI eds). Society for Experimental Biology, UK, pp. 91-107. Variation in nutrient concentrations of Pinus sylvestris stems. Scandinavian Journal of Forest Research 4: 443-451. Construction of a 1961-1990 European climatology for climate change modelling and impact applications. International Journal of Climatology 15: 1333-1363. Carbon allocation between tree root growth and root respiration in boreal pine forest. Oecologia 132: 579581. Regional aspects of forests in Europe: a preliminary study of Pinus sylvestris. 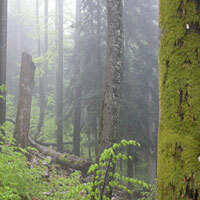 In: “State and Change of Forest Ecosystems. Indicators in Current Research” (Ågren GI ed). Swed. Univ. Agric. Sci., Dept. Ecology and Environmental Research, Report No. 13, pp. 315-332. Plants and microclimate (2nd edn). Cambridge Univ. Press, Cambridge, UK, pp. 428. Daily and seasonal CO2 exchange in Scots pine grown under elevated O3 and CO2: experiment and simulation. Plant Ecology 136: 229-248. An improved method for estimating surface humidity from daily minimum temperature. Agricultural and Forest Meteorology 85: 87-98. Comparison of fine root dynamics in Scots pine and pedunculate oak in sandy soil. Plant Soil 276: 3345. Evaluation of 6 process-based forest growth models based on eddy-covariance measurements of CO2 and H2O fluxes at 6 forest sites in Europe. Global Change Biology 8: 213-230. Estimating surface energy-balance components from remotely sensed data. In: “Theory and Applications of Optical Remote Sensing” (Asrar G ed). Wiley, New York, USA, pp. 604-627. A generalized model of forest productivity using simplified concepts of radiation-use efficiency, carbon balance and partitioning. Forest Ecology Management 95: 209-228. Acclimation of Russian forests to recent changes in climate. Global Change Biology 11: 20902102. A critical appraisal of a combined stomatal-photosynthesis model for C3 plants. Plant, Cell and Environment 18: 339-355. Scaling to a common temperature improves the correlation between the photosynthesis parameters Jmax and Vcmax. Journal of Experimental Botany 48: 345-347. Carbon allocation and tree growth under hydraulic constraints in Scots pine (Pinus sylvestris L.). PhD Thesis, University of Edinburgh, UK. Measurement of apoplasmic and cell-to-cell components of root hydraulic conductance by a pressure clamp technique. Planta 199: 296-306. Age-related decline in stand productivity: the role of structural acclimation under hydraulic constraints. Plant, Cell and Environment 23: 251-263. Adjustment of tree structure in response to the environment under hydraulic constraints. Functional Ecology 16: 385-393. Growth patterns and carbon balance of Pinus radiata and Pseudotsuga menziesii plantations under climate change scenarios in Italy. Forest Ecology and Management 202: 93-105. Elementi di Agrometeorologia. CNR-IATA, Firenze, pp. 76. The influence of soil temperature on transpiration: a plot scale manipulation in a young Scots pine stand. Forest Ecology and Management 195: 1528. Leaf/sapwood area ratios in Scots pine show acclimation across Europe. Canadian Journal of Forest Research 31: 442456. Hydraulic conductance, light interception and needle nutrient concentration in Scots pine stands and their relations with net primary productivity. Tree Physiology 16: 459-468. Climate influences the leaf area-sapwood area ratio in Scots pine. Tree Physiology 15: 1-10. Developmental patterns of above-ground xylem conductance in a Scots pine (Pinus sylvestris L.) age sequence. Plant, Cell and Environment 19: 939-948. How do crops manipulate water supply and demand? Philos Trans R Soc Lond A Math Phys Sci 316:245-259. Principles of environmental physics (2nd edn.). Edward Arnold, New York, USA, pp. 53-54. RESCAP: a resource capture model for sorghum and pearl millet. In: “Modelling the growth and development of sorghum and pearl millet” (Virmani SM, Tandon HLS, Alagarswamy G eds). ICRISAT Research Bulletin, Patancheru, India, pp. 30-34. Nutrient conservation increases with latitude of origin in European Pinus sylvestris populations. Oecologia 136 220-235. Dry-matter production by Pinus sylvestris L. Annals of Botany 21: 287-314. The forest area of the world and its potential productivity. Dept. of Geography, Royal Univ. of Gothenburgh, Sweden. Fine root dynamics in a Scots pine stand with and without near optimum nutrient and water regimes. Acta Phytogeographica Suecica 68: 101-110. Plasticity in hydraulic architecture of Scots pine across Eurasia. Oecologia 153: 245-259. On the assessment of surface heat flux and evaporation using large scale parameters. Monthly Weather Review 100: 81-92. A study of root distribution and growth in a Pinus sylvestris L. (Scots pine) plantation in East Anglia. Plant Soil 44X: 607-621. The use of tree-cutting techniques in the study of the water relations of mature Pinus sylvestris L. Journal of Experimental Botany 28: 751-767. The radiation regime and architecture of plant stands. Dr. W. Junk Publishers, The Hague, The Netherlands, pp. 391. A simple method for estimating gross carbon budgets for vegetation in forest ecosystems. Tree Physiology 9: 255-266. Foliar maintenance respiration of sub-alpine and boreal trees and shrubs in relation to nitrogen content. Plant, Cell and Environment 18: 765-772. Dry-matter partitioning and fine root production in forests. New approaches to a difficult problem. In: “Biomass production by fast-growing trees” (Pereira JS, Landsberg JJ eds). Kluwer Academic Publisher, Dordrecht, The Netherlands, pp. 57-72. The role of increasing temperature variability in European summer heatwaves. Nature 427: 332-335. Foliage and fine root longevity of pines. Ecological Bulletins 32: 136-153. Statistical yearbook of forestry. Finnish Forest Research Institute, Helsinki, Finland. Aerodynamic roughness of a plant canopy: a numerical experiment. Agricultural Meteorology 26: 51-65. Plant and crop modelling. Clarendon Press, Oxford, UK. Modelling respiration of vegetation: evidence for a general temperature-dependent Q10. Global Change Biology 7: 223-230. Vulnerability of xylem to cavitation and embolism. Annual Review of Plant Physiolgy 40: 19-38. Acclimation of photosynthetic parameters in Scots pine after three years exposure to elevated temperature and CO2. Agricultural and Forest Meteorolgy 82: 195-217. Canopy CO2 exchange of Scots pine and its seasonal variation after four-year exposure to elevated CO2 and temperature. Agricultural and Forest Meteorolgy 82: 1-27. The self-thinning rule. Advances in Ecololgical Research 14: 167-225. Relationship between height growth of Scots pine and site factors in Great Britain. Forest Ecology Management 4: 225-245. Conducting sapwood area, foliage area, and permeability in mature trees of Picea sitchensis and Pinus contorta. Canadian Journal of Forest Research 14: 940-947.